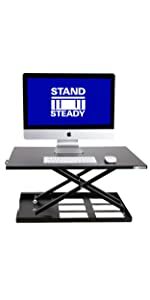 Stand Steady X-Elite Pro Corner Standing Desk Converter is the best, and only, single spacious level standing desk converter that is made for cubicles and L-shaped desks. With all of the health benefits of standing and gaining an extra 5 square feet of space to your corner work set up, this sit stand desk is a win-win! What Makes X-Elite Pro Corner Desk Excellent? PERFECTLY SHAPED FOR CUBICLES AND L-SHAPED DESKS: The X-Elite Pro Corner is a adjustable standing desk converter with angled edges that fits perfectly into corners, cubicles and on L-shaped desks. EASY TO RAISE / LOWER: Lift and lower your desk quickly, easily with the assist of a strong, pneumatic pump height adjuster that does the heavy lifting for you! HUGE ONE-LEVEL SURFACE WITH SMALL FOOTPRINT: The large desktop converter provides approximately 5 square feet of space that can accommodate your two monitors, keyboard, mouse, coffee mug, and more. No problem, spread out all of your papers without losing cubicle real estate! 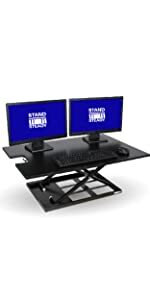 STURDY CONSTRUCTION: Solid build with sturdy base and firm locking spring pump, experience bounce-less typing and wobble-free work at any height with this sturdy and stable desktop. AESTHETIC DESIGN: Rounded corners and beveled edges smoothly combine on this stand up desk in a stylish and sleek design. FULLY ASSEMBLED: This stand up desk arrives fully assembled and ready to use out of the box! Standing while you work is a breeze with our new X-Elite Pro Corner Standing Desk. A strong and durable pneumatic pump raises your desk quickly and quietly. Lift the side handle and let the pump do the work! You can choose any height that works for you and when you’re ready to sit again, lift the handle and apply downward pressure to return to a lower position. Our stand fans highly recommend this product - Find out what they are saying below! “LOTS OF SPACE AND STURDY I love this desk!! It is hard for me to sit all day, but I have to deal with a lot of paperwork. This desk has so much room!! I have 2 monitors, a keyboard and mouse, and plenty of room for my papers that I'm working on. It is very easy to lift and lower, plus it came fully assembled.” - Erin N.
“WE LOVE THE STAND STEADY!! My team loves their Stand Steady's, they have enough room for both large monitors along with their keyboard, mouse and other items. Wonderful design was critical in our decision to purchase since the team members are in cubicles.” - Kellye L.
COMPATIBLE WITH: DiploMat Standing Desk Mat, TerraMat Standing Desk Mat, Dual Monitor Arm, and more! Love this desk as much as we do but looking for a different size? X-Elite Pro Corner 39" X-Elite Pro 28" X-Elite XL 36" X-Elite Glide 31"
39.25” x 28” 28" X 20" 36" X 24" 31" X 21"
Stand Steady also offers a 90-day risk-free policy! We work with you to make sure we provide the right ergonomic solution that fits your needs. So, what are you waiting for? Trust the company that stands with you and start “standing steady” TODAY! 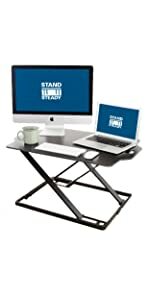 We love the Stand Steady!! My team loves their Stand Steady's, they have enough room for both large monitors along with their keyboard, mouse and other items. Wonderful design was critical in our decision to purchase since the team members are in cubicles. I love this desk!! It is hard for me to sit all day, but I have to deal with a lot of paperwork. This desk has so much room!! I have 2 monitors, a keyboard and mouse, and plenty of room for my papers that I'm working on. It is very easy to lift and lower, plus it came fully assembled. I even got a handwritten "thank you" from the seller and some cute little sticky notes. That never happens! It is a very fair price for the size and sturdiness.